A significant snowstorm affected the region in two parts in this time frame, with a coastal storm staying south of the area on March 6 and an inverted trough producing heavy snow on March 7-8. The first round of the storm was expected to produce light to moderate snowfall but underperformed, while the second part overperformed with widespread moderate-heavy snow. Snow totals ended up between 4-10 inches in north NJ, NYC and LI, and 8-16 inches in SE NY and southern CT. The long lasting storm started from a strong upper level low tracking southeast from North Dakota on 3/4 to the Ohio Valley and the Mid Atlantic on 3/5 and 3/6. On Tuesday, March 5, a low pressure developed near Missouri and tracked into the southern Ohio Valley region, intensifying with a minimum pressure of 1002 mb. This low produced widespread heavy snow from the Midwest into Chicago, Indiana and Ohio. Early on Wednesday, March 6, the low became negatively tilted over Ohio, transferring its energy to a developing secondary low over North Carolina, which took over as the primary low while over southeast Virginia, producing widespread snow, wind and coastal flooding in the Mid Atlantic. The low quickly intensified with a minimum pressure near 994 mb by the evening, when it became vertically stacked and shifted to the east with weakening preciptation intensity and an expanding precip shield. On Thursday, March 7, a shortwave that was previously over southern Canada tracked southeast, splitting into a closed upper level low and reaching western New York, where it began to interact and phase with the upper level low associated with the main coastal low. This setup resulted in the low pressure stalling while becoming more negatively tilted, with a surface inverted trough stretching northwest into the Northeast US region, where widespread heavy snow developed and persisted into Friday, March 8. The storm finally exited the region on Friday evening as the interior ULL tracked offshore, phasing with the coastal ULL. Regional radar image from 9:28 AM 3/6, from the National Weather Service. Rain fell north and east of Washington DC, with snow to the west and south. Snow initially spread into the southern Mid Atlantic late on 3/5 into early 3/6, falling heavy at times. As the low pressure continued to intensify near SE Virginia with a strong east wind developing, coastal locations from Washington DC and further east changed over to heavy rain, while heavy snow continued over western Virginia, West Virginia, and western Maryland. 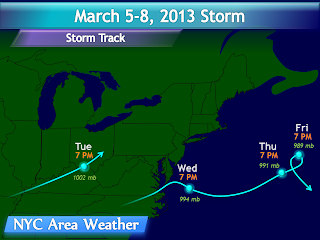 Throughout Wednesday, March 6, the precipitation shield from the coastal low reached its northernmost point, over southern PA into central NJ; the strongest dynamics were focused over central Virginia, where heavy snow continued to fall, while the rest of the Mid Atlantic into southern PA and NJ observed rain or a rain/snow mix. Regional radar image from 1:38 AM 3/7, from the National Weather Service, showing moderate snow bands from the coastal low over central Long Island. The northern end of the precipitation shield was south of the forecast. By the overnight hours, the coastal low was steadily moving east while the precipitation shield expanded north, making its closest approach to the NYC area. Light rain/snow showers were observed just south/east of NYC, while light to moderate snow fell further east in Long Island and southern CT. This setup continued through the morning of Thursday, 3/7, when the inverted trough setup began to take shape. Throughout the late morning and afternoon hours, precipitation gradually expanded northwest to cover the rest of the area and New England; initially, snow fell north of NYC with a rain/snow mix from NYC and further south, although precipitation type gradually changed over to snow in the late afternoon. Regional radar image from 6:18 AM 3/8, from the National Weather Service. 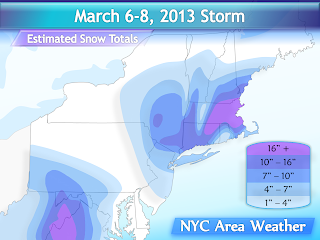 Heavy snow spread from Boston to NE CT, with moderate snow in the NYC area. During the evening hours, the inverted trough was already set up in place with bands of heavy snow heading west from the eastern New England coast into eastern NY state and the NYC area. Surface temperatures were near to slightly above freezing, and the snow initially struggled to accumulate across the area. As the overnight hours progressed, temperatures slightly fell and and more snow bands continued to rotate southwest into the area, resulting in accumulations gradually building up. The heaviest snow bands were generally stationary over the eastern half of Massachusetts into northeastern and central Connecticut; central Massachusetts and Rhode Island were under a persistent dry slot, and observed very little snow compared to surrounding areas. Widespread moderate to heavy snow continued into Friday morning, 3/8, with the precipitation shield gradually shrinking through the late morning and early afternoon hours. By 1-2 PM, the edge of the shrinking precip shield started to enter the area as surface temperatures began to warm up, resulting in some locations changing over to a rain/snow mix. Snow ended across most of the area by 4-5 PM as the weakening precipitation shifted to the south. As previously mentioned, this storm failed to perform as expected, with several differences in the outcome compared to the forecasts, even those made on the day of the storm. Washington DC, which has seen very little snow throughout the winter, was forecast to receive a major snowstorm with over 8-12 inches of snow; instead, a lack of a cold air mass and easterly winds at the lower levels resulted in a changeover to rain with only minimal accumulations, while locations further west continued to see heavy snow, with 10-20 inches of snow falling in western Virginia, eastern West Virginia, and western Maryland. Southeast PA and south-central NJ were originally forecast to receive light to moderate accumulations from the coastal low as well, but observed only a rain/snow mix with minimal accumulations at most. Some snow from the coastal low spread into Long Island and southern CT, where at least a coating to 2 inches of snow were observed. Snow from the inverted trough, however, exceeded the expectations, even as the snow was already falling. The original outlook for the area was for at least 2 to 5 inches of snow, with 4 to 8 inches in south-central New England, locally higher. Snowfall rates were heavier than expected across the region, especially under the Boston to south CT/SE NY axis where heavy snow bands frequently trained. Snow totals generally ended up between 4 and 10 inches across most of northern NJ and Long Island, and 8 to 16 inches in southeastern NY and southern CT. The highest total reported in the area was 15.5″ in Chester, NY (Orange county), with 15.0″ in Colchester, CT (New London county); Central Park in Manhattan received 4 inches of snow. The highest storm totals were found from NE Connecticut into the eastern half of Massachusetts, where totals as high as 20-26 inches of snow were reported. Totals were variable in New England, however, with persistent dry slots focusing over central Massachusetts and Rhode Island where less than 4-6 inches were observed.